The fascination with the Bucs drafting an inside linebacker with the No. 5 pick is completely lost on Joe. In a passing league with the Bucs possessing a limited pass rush (led by a 30-year old player under contract for two more seasons and who is a potential salary-cap-casualty target), in a game that has turned vertical with weapons playing on the perimeter, the Bucs are supposed to draft someone to patrol the middle? Joe doesn’t get it. At all. But could the Bucs have something up their sleeve if they draft an inside linebacker? (Props to “JoeFromWisco” for pointing out to Joe that inside linebacker A.J. Hawk was drafted No. 5 by the Packers in 2006 — which doesn’t exactly make Joe sleep any easier at night). From the fingertips of mock draft-scowling, L.L. Bean-wearing, Second Amendment abolitionist, Mike Florio-arguing, parrot-insensitive, chewing-with-his-mouth-open, soup-gulping, California train-romancing, anti-football proliferation, outhouse-admiring, airline-napping, steerage-flying, Yogi Berra-worshiping, urinal picture-taking, video game-playing, Taylor Swift-listening, pickpocket-thwarting, Bucs-uniform-frowning, Allie-LaForce-smitten, Big-Ten-Network-hating, pedestrian-bumping, olive oil-lapping, popcorn-munching, coffee-slurping, fried-chicken-eating, oatmeal-loving, circle-jerking, craft beer-chugging, cricket-watching, scone-loathing, college football-naïve, baseball-box-score-reading, NPR-honk, filthy-hotel-staying, fight-instigating, barista-training social activist Peter King, of NBC fame, his sources say one reason so many free agent defensive linemen are unsigned is that teams would rather draft cheaper players. Is this possibly a plan hatched by Bucs AC/DC-loving general manager Jason Licht? Draft an inside linebacker because he can get Ndamukong Suh or Muhammad Wilkerson in a buyer’s market after the draft? This isn’t an awful idea. But there is one big hiccup if this is what Licht plans to do. How exactly is Licht going to clear cap room to sign a Suh or a Wilkerson? The Bucs are in cap hell to begin with and need roughly $8 million just to sign the rookies. In general this makes sense as a reason these guys haven’t signed. Teams want to see if their favorite DL prospect falls to them or not. I don’t see many of those guys as good fits tho. In general we need to rebuild the entire defense. That’s some strange reasoning Joe. Why would Licht sign a DT after the draft if we take a MLB? wouldn’t we still have GMC and Vea? i dont see us needing 3 DTs if we are moving to a 3-4 base. The only scenario in which we would sign a DT is if we cut GMC, and that would give us plenty of cap space to do so. It’s pretty much a foregone conclusion it is unlikely GMC is back. If we sign Suh we can finally end this ridiculous debate over who’s better. Ray Charles, Stevie Wonder and Helen Keller all know the correct answer but some Bucs fans are still trying to figure it out. Listened to the Ira cast from the other and it still boggles my mind that one of the Joe’s still doesn’t get how or why teams draft. Unless 1 of the big 3 drop and it’s not a forgone conclusion that teams love Josh Allen in the top 5. The Bucs will not reach for an Edge player at 5 and don’t act like you don’t know what that means like when you freak out on the Pod. If they have a player slotted between 10-15 then that’s where they will target to get that player. By trading down if the players they slotted for 5 are gone. They will not take Sweat or Burns or even Josh Allen at 5 if they have all 3 graded closely And they can move down and still get one where they have him slotted. This is the real world of drafting. Your logic for not drafting White works the opposite for not reaching for an Edge player at 5. Your arguments are fundamentally flawed. you are giving Licht too much credit that he has a plan. He is totally clueless and will screw up this draft again. History does repeat itself. Agree with L Cornelius here. Most Buc fans truly don’t understand our Defense needs quite a bit of rebuilding. We’ve paid far to much attention to the dazzling passing of Jameis and our Offense. When..are we..going to start stopping somebody? Thats the question. Ask yourselves how many games you have watched us play over the last 4 or 5 yrs where you knew we were going to lose despite being ahead at the end of games. It seems to me that teams burnt us constantly with two-step drops and quick passes over the middle…..what’s wrong with strengthening the middle….and we could also stand to improve our run defense. Yea I know,,,,,3 likely hall of fame QBs and a passing league….yada, yada, yada. Let me put this in simple terms Joe. If the inside linebacker is deemed the best player available you take him at #5. The Bucs should be trying to build a winning franchise year after year. Taking the BPA in rounds 1 & 2 helps build the foundation. Reaching for needs early in the draft is what sets teams back. Middle linebacker is a need and we can possibly get the best in the draft at 5 yet Joe doesn’t get it. (Kamara, McCaffery and Freeman ) would love for us to ignore the middle of our defense. Joe what do you suggest if the big 3 are gone and no trade partner?? I’ll take White. “It’s pretty much a foregone conclusion it is unlikely GMC is back.” If that’s the case then you have the answer to your last question. Maybe we can get rid of McCoy. Take best available player if not we that is how we ended up drafting a kicker in the 2nd by drafting for need. Everybody keeps saying Tampa has to have pass rushers. ETC. ETC. Somebody please look up where the Patriots ranked last year in Sack Totals. 4 picks came from guy who rarely started. Todd Bowles is gonna make this Bucs team look completely different and we will get production out of players we already have. That said, stopping the quick slants and WR/RB screens is an obvious need to me. One more glaring stat. Tampa was ranked in the Top 5 in SOLO tackles. NE gave up 29 passing TDs. You think Allen or Sweat or Burns etc helps that stat? How bout an ILB like White? You dont pick the 3rd or 4th best pass rusher at pick #5. Period. You lose all value in the pick. You dont take a 10-20 range player at #5. The 3rd round and on is where you can start to ignore your rankings a little more, not in the top 10. One of these Joe’s will never ever get it. This, I’m assuming, is the same Joe that pounded the table for Trent Richardson and Jonny Manziel. News flash…every team in the NFL can pass the ball between the 20’s, every team. It’s the teams that can score TD’s in the red zone and force field goal attempts in the red zone that win. This team couldn’t run in the red zone and couldn’t stop the run in the red zone. Tell me again how probably the highest rated LB to come out since Patrick Willis doesn’t help accomplish one of these goals? Joe, you don’t think our inability to stop a slant pass is an issue? Again, you can’t sack a QB if he immediately throws it 5 yards to a wide open slant receiver who then runs for another 15 yards. I just don’t understand how you act like this is not a position of need. We need a ball hawk and a thumper out there in the middle of the field. Devin White is the perfect fit for the defenses biggest area of need in 2019. So one out of four turned out not to be a bust, 25%. Meanwhile if White is the second coming of Hardy Nickerson, if he really is that good (and I don’t watch enough college tape to really have any idea how good is is), when you have a 25% success rate – why wouldn’t you take what everyone says is the guaranteed star player? If a MLB is so important why not trade back to 10,11,13,or 15 and get Devin Bush who is just as good as White. He may be a couple inches shorter and 1/100th second slower. Then they can pick up an edge rusher (Polite) and a RB (Henderson)in the 2nd. With a stud like Henderson (8.9 ypc), the defense would hardly ever get on the field. What’s the best defense……Strong offense! So 10 picks… You have one bonafide Hall of Famer. You have a year in, year out pro-bowler in McCoy. You have the best offensive lineman in team history in Gruber. Then obviously with Winston, it’s still in the air. Bo Jackson obviously became a star, with the Raiders, whose career was shortened by injury. Caddy was a star whose career was shortened by injury. Bell and Adams were both traded for good picks before they died on the team the Bucs traded them to. Vinny played literally forever and is one of the most accomplished passers ever in the game even if he was never really all that great. Then finally is the most interesting pick here, that being Keith McCants. Everyone, and I mean everyone, thought for certain the Bucs were drafting Emmitt Smith here, that is until the Bucs a few days before the draft traded for former Bandit RB Gary Anderson. That removed RB from the “need” category… so no Emmitt Smith for us. So the next obvious choice was Junior Seau, but then he said he’d retire before he’d play for the Bucs. Normally this is an empty threat, but only 5 years earlier Bo Jackson said the same thing, and literally sat out a season rather than play for Tampa. So Ray Perkins, who is Arians mentor, selected his Alabama favorite Keith McCants – who, out of this list, was by far the least impactful player since Gaines Adams at least got the Bucs a high pick back in exchange for him. We have not had an excellent LB since Brooks. Alexander and David were often hurt or misused. Devin White can get to the QB as well as help aginst the run and in coverage. The fans have been screaming for an alpha style leader and that’s what White is. If somehow Allen, Bosa, or Williams is available great but unlikely. That’s it, and it’s not a bad list at all. Hugh Green was a star, a two time All-Pro with the Bucs before being traded to the Dolphins for a 1st and some 2nds (I believe). Broderick Thomas was a really good player and people always overlook him – in fact even with all the excellent LB play the team has had over the years, it’s Broderick Thomas that had the best stat year of any of them. In 1991 he had 174 tackles, 11 sacks, 7 forced fumbles. Also the tackle stats never used to be uniform, but by memory the team claimed he had 211 tackles, an insane number. Broderick was killed by playing on awful teams and even with that insane season he didn’t even make the Pro-Bowl, much the same way the morons at the NFL never pick David to the Pro-Bowl despite being on of the best LBs in the game. Anywho, that’s the entire list, only two LBs ever picked by the Bucs in the top 10, and I don’t care what anyone says about Thomas, he was really good. I’m giving the Bucs 2/2 on top 10 LBs. Rod not sure what it matters how a couple of LBs performed that were drafted 30 years ago. Thanks for the shout out, Joe!! It would be nice having Devin White and his 4.4 speed shadow McCaffrey and Kamara but we NEED someone to replace JPP eventually. It seems like every team in the NFL sees something that this franchise doesn’t. Whether it’s a running back or a defensive end we seem to miss on these guys unless it’s the obvious pick (Mike Evans). I get the draft is a crap shoot but it’s almost like Helen Keller makes these mid round picks for us. 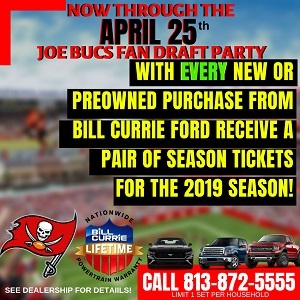 TouchDownTampaBay – Yeah, a Bucs site, where fans talk about the history of the team, what does that have to do anything!?! We should only speculate on things that haven’t happened yet! I hope (but doubt) that the Bucs employ the same approach to QBs in next years’ draft that King uses here referencing this D-lineman-strong draft. Enjoyed the Hugh Green reference. He was a defensive end in college that transitioned to linebacker for the bucs. Could have been even greater. Showed some great talent those 1st couple of years. Stress is bad for you. If you go popping an aneurysm during a podcast, who else is Ira going to argue with? Yes, an edge rusher would be amazing to get at 5. But if the top 3 are gone by 5, Devin White is a much better pick than reaching for someone that is rated 10 – 15. Imagine if he does become a leader on this leaderless team. That in itself is worth the pick. This defense has allowed teams to turn short, inside passes into explosive plays way too much the last 4 years, and that was with Alexander in the middle. Having someone who can stop that crap from happening is a good thing. How many edge rushers that are any good came from the first round? A lot of great edge rushers were actually drafted lower, but didn’t show out until they played in the NFL. Just because someone’s measurables are off the charts, the one thing that can’t be measured is heart and drive. If a player can show that he can push through when things get tough and make a play when it seems unlikely, that is what we should be looking for. Again, I am not advocating that the Bucs should target White, but if they don’t have another option at #5, don’t pi$$ it away – pick White!